Christmas time is kicked off by my favorite holiday. Thanksgiving, it’s my favorite holiday because it involves the Five most important F’s in life, Food, Family, Friends, Fun and Football. Following thanksgiving, when you are doing dishes and playing Christmas music for the first time (That is right, the acceptable day to start Christmas music is dishes on thanksgiving FYI) begins the Christmas season. This year I decided to call the Christmas season my journey to Jesus, it is inspired by the Magi and their journey to 8lb 12oz baby Jesus (Who was probably more like 2 years old when they finally found him). They heard from God about Jesus, then they risked seeking after him leaving their lives behind, then they gave him gifts and worshipped him. What if I took the time to do three things. Take time to Hear Jesus, spend time Seeking Jesus, then spend time worshipping him. 1. Take time to hear Jesus. Christmas can often be a time where we hear a lot about Jesus but not spend a lot of time hearing what he has to say. (Job 33:14For God speaks again and again, though people do not recognize it.) He wants to remind you through all the busyness that we go through to celebrate his birth, that he came to love us because we are worth loving, he came to be a wonderful counselor, prince of peace and as an amazing savior for ALL. 2.Take time to Pursue Jesus. Being in relationships in general require pursuit, especially with God. He has so much to offer us that it takes constant pursuit (Matt 6:33) “But seek first the kingdom of God and his righteousness, and all these things will be added to you.” When we pursue God we know more about him, and when we know more about him, we learn a lot about how much we are loved, cared for and reminded by our heavenly father that he has a plan in any season we are in. When you hear his voice don’t just consider it a good thought, go after it and see what he has for you. 3. Take the time to worship. Remind yourself that the Christmas carols we sing are actually praising God for his son, and when we praise God we are putting him first and thanking him for his goodness to us.. (Psalm 63:3-4) “Because Your lovingkindness is better than life, My lips shall praise You Thus I will bless You while I live; I will lift up my hands in Your name.” He deserves our worship, in forms of bringing our gifts to him, singing/shouting his praise, of loving our neighbor. Worship does the for the soul like milk does for a body, GOOD! I love christmas and everything that comes with it, family, food, presents, christmas movies, christmas music, and so many other wonderful things. I hope that in all of it, that you can hear from God, spend time pursuing him and praising him for all he’s doing and yet to do in your life. As I sit here on Martin Luther King Jr. Day, I am reflecting on what MLK has done for me. As a white male living in a suburban context I may never know to the fullest extent what MLK accomplished with his journey to end discrimination and segregation (no I don’t think we are fully there yet but my hope is one day it [racism and discrimination] will end). What I do know is MLK and his courage to stand up against the “acceptable societal norm” has made my life so much richer. That I grew up in a time where I was allowed to go to school with people who were of different races and culture than I. Where my life has been enriched by my friends no matter what their color was because I wasn’t separated from them I was taught to embrace “different”. I am so glad and blessed that I have friends who are from different races and cultures than me that have made me a better person. I LOVE what MLK had to say about refusing to accept racism as an acceptable end. “I refuse to accept the view that mankind is so tragically bound to the starless midnight of racism and war that the bright daybreak of peace and brotherhood can never become a reality… I believe that unarmed truth and unconditional love will have the final word.” My hope is that we can all learn to love unconditionally so that “unarmed truth and unconditional love will have the final word”. 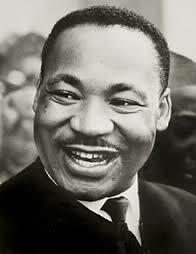 Thanks Martin Luther King for helping me grow up in a better world. The end of all things is near. Therefore be alert and of sober mind so that you may pray. Above all, love each other deeply, because love covers over a multitude of sins. Offer hospitality to one another without grumbling. Each of you should use whatever gift you have received to serve others, as faithful stewards of God’s grace in its various forms. If anyone speaks, they should do so as one who speaks the very words of God. If anyone serves, they should do so with the strength God provides, so that in all things God may be praised through Jesus Christ. To him be the glory and the power for ever and ever. Amen. A good reminder to me today. That I need to pray first, and serve humbly so that I can be the best representation of Christ today. That Jesus was a hospitable, lord make me a generous host. So today during my time in the word, The Lord said something to me that hurt, not because it was negative, but because I was convicted of my words and actions. I have a fear if failure, I have a fear of failing and letting it reflect poorly on me. I grew up with a performance oriented view of grace and a performance oriented view of my value. In that I have gotten really good at blaming others for my failures. It reminds me a little like Israel, as they blamed moses for leading them astray in the desert as it was their fault they kept whining and disobeying God, but felt like they had a right to blame someone else. Today I became very convicted about that. First my reputation of perfect performance shouldn’t mean that much to me (and thats a lot of pressure) rather my reputation should be based in my love for Jesus, people and my character. I believe that my blaming others has hindered me from growing spiritually as much as I should. So Lord, forgive me for blaming others for my shortcomings. Today I choose to walk in forgiveness, for those I felt who have wronged me. Grace for myself because his grace is sufficient for me. Responsibility for my actions. Spiritual authority, the enemy “ain’t got nothing on me” (to quote Denzel). Faith, that his path leads to righteousness and that following Christ will always end for my good. Today while I was doing my devotions (I do Life Journal), I was reading in Genesis 6-7 the story of the flood that restarted the earth. I was reminded that the flood, while initially feels like a tragic story where God is restarting the earth because of how messed up humanity is. Then I thought, HOW INCREDIBLE! God knew that the flood was something, that he would have to do again, that the first time was not going to be enough. His approach the second time around, was to flood us in the blood of his son. The blood that gives us fresh mercy and grace everyday, that we are constantly being flooded out by God. While our humanity will never cease to come back, his grace even more so will never stop! Grateful for a God who knows the best way to show me mercy and clean out my life! I learned a lot yesterday! My desire is to serve the Lord, with all my heart, strength, body, and soul. Part of this is making the effort to learn from the best and become a student of ministry. Especially modern day youth ministry. Yesterday I did, because I was blessed with the opportunity to learn from some of the best, I got to hear from Judah Smith, Rich Wilkerson Jr., Chris Durso and Jude Fouquier. I learned so much about youth ministry, life as a pastor and so much about kingdom thinking. I believe Kingdom thinking is imperative to our churches, so I want to share what I learned yesterday. Because that is my responsibility as a minister is to share what I have been given. I hope that you get as much out of it as I did. The three C’s of culture with Rich Wilkerson Jr. Expert wine tasters can taste the identity of a wine maker by just one sip of the product. You cannot separate the leader from the culture. You have to do you, otherwise you are an imposter. Rich tells a story about his grandma’s gravy, when he moved away his mom tried to make it, she screwed it up twice. She got all of the ingredients right, she cooked it right, except it was missing the special ingredient. That ingredient is Grandma. Culture can only exist with the person God helped create it for. If you want to change the culture there is something you need to know. You cannot change anything you are willing to tolerate. When you tolerate things than why would people think it needs to change. You cant bad mouth it if you aren’t willing to change it. Culture is something that people notice, but they can’t quite pinpoint it. You know stinky guy, everyone knows stinky guy but nobody says anything… You have to tell him or he wont stop smelling, you might even start to smell like him. To form culture, you need to cast vision. Even the Lord says without vision my people will perish. There are two types of vision, short term & long term. Short term- What do you want to accomplish this week/month? (connect with new students, have a coffee meeting with a leader etc.) Short term goals are important because they give you a gauge and something to look forward to every week. Long term goals are numerical, by this time we want this many people, or we want this # for this event, long term gives you goals to measure and something that last for 1 year plus. You have 52 weeks a year, make them all count. The Vous does 1 big meeting and then three weeks promoting the next big week, build up anticipation. We care about our people, we have to. We aren’t called to just preach, if that’s you good luck. Rich used the example that he cares so much about the dance team ministry, he could care less what they do, but he cares about them. When people are cared for, they care for the things you care for, even more so than you ever could. Rich started with a chair stacking ministry, then he had start he got them to care, one volunteer changed them to the chair engineers. Sometimes stopping things can be way more powerful than starting things. Get off the horse if the horse is dead. Learn to reframe your ministry. Faith is about doing what God has called you to do. It takes faith in order to do that and expand/trim back the ministry. Unstoppable Youth Ministry with Rich Wilkerson Jr.
What do you do when life caves in you? We have a lot of different encounters in life good, bad, awkward. There’s nothing better in life than what happens as a result of a God encounter. Anointing can take a shepherd and make him a king. What can the Lord’s anointing do for you? Anointing happens as a pouring of the spirit that last from that day on. Unstoppable youth ministries are driven by a God encounter. There is nothing better for a person than a God encounter. That’s why we do what we do, we encountered God. Don’t ever forget your God encounter. We live in a time where people are looking for a God encounter. There is no better time to pick up our cross and our burden for the city. (this is collin) How do we reach the city? How do we create something that our city has never seen, but we desperately need. How do we win Gresham/Portland? It’s going to take people who have different anointings, different callings, kingdom minded thinking to do it. There is times in our life where everything goes well, ministry is awesome. We don’t have control over it, you can go from David who is loved and who has songs to David hiding in caves because crazy Saul is trying to kill him. When you are in a cave is when God is ready to do his best work with you. God takes the misfits (people in debt, distressed, discontent) puts them in the cave and has David lead them into become the greatest kingdom Israel has ever seen. God doesn’t give you the perfect people for a perfect team. He gives you people to build up. When you are in a cave you often cant see your way out. You have to go back to the last thing God called you to and walk what is in front of you and let God do what he does. It is in caves where God builds faith, caves allow new faith and allows that faith to be tested. David learned more about being a king in the cave, than he ever did in the palace. Take your cave as a blessing, deal with it. God has mercy, God fulfills your purpose. Just because we tell people what to do, doesn’t mean they will catch it. You have to walk them through it and explain it. It’s important to remember when it comes to discipleship you aren’t the best. You know the best. Chris took his youth group from 500+ to less than 100 because he “knew best” almost got fired by his dad. He abandoned prayer and the answer to pprayer that the lord provided. It is imperative to identify who is going to take your place. The moment you choose, doesn’t = you losing your job. It means you begin to train and equip them. It is all about doing life together, that’s where discipleship happens. In life. When you pick that person, ask others what they say about them? Are they an upstanding citizen. Do they have character at church but they are sleeping around? If they have a moral failure. The best days are ahead!!! Involve them in the mission! Paul didn’t make timothy wait to start ministry, he made Timothy jump in with him and silas. Great leaders desire to raise up great leaders. Paul Circumcised timothy so that he wouldn’t be limited in who he could minister to. Once you deal with the sensitive areas in a persons life, their ability to preach/speak to all is incredibly doubled. Talent never trumps character when picking an heir. Just as Paul had Timothy come alongside and help in ministry we should do the same. Just because something sounds spiritual, doesn’t make it spirit led. We have to have a shallow leadership pool, one that anyone can dive into. If you are yelling to lead, you are not a good leader. Lead people through your successor, by thinking about the future now. Look for the hand of God on your students, it’s not their talents that will get them anywhere it is the hand of God. You aren’t going to have the head starts that Judah, Chris and Rich had. Deal with it, don’t get jealous, pray you are the start of generational blessing. Who ya gonna cheat? When you say yes to something you are agreeing to do less of something else. Matthew 28:28 our mission is to get people to stand in line behind us in eternity, that is what God is going to look at. Who did you bring with you. Our ministry services, are for believers. My mission is to the one who doesn’t believe. #’s come and go there is never base your feeling on signifigance on numbers because Jude went from 200 to 5 to what City Church is now. If you cant make a disciple, you are one. Mission is what gets heaven excited. What are you doing to advance the word of God. When you die, will you be able to say you completed your God given mission. Change is a good thing, unless it’s bad change. Change has gotten a weird rap, everybody is all about it, but it isn’t always good. Biblical change isn’t changing people. If you want change preach Jesus. Change doesn’t come from preaching against something, change doesn’t come from condemnation. Help people change by showing them they way to change give them a new focal point. Don’t preach mathematical terms to teach repentance nobody gets is. You cannot force somebody to realize that they are a sinner and they need Jesus. Unless Jesus burns hearts and opens the eyes of our students than we are useless. People have to realize they need a savior. Realization is a sovereign move of God. That’s it and that’s all. Jesus had no issues, that’s who we preach for people to realize they need him. He has it all together. Repentance is that simple realize you need a savior, return to God. People cant figure out what to turn to if we are only preaching turn away from. Hebrews 10 talks about there is one sacrifice, which allows the Israelites to stop focusing on their sin and coming together to talk about how sucky they are and dwell on sin. The sacrifice that Jesus gave allows us to look at our savior. Love will always be greater than fear. Don’t preach fear, don’t instill fear. Instill love so that fear has no chance to exist. When you are so in love with Jesus, you forget to sin. Repentance is not remorse, or resolution. New years resolutions never work, why should our resolutions to stop sinning work? Remission is past present and future. Christ is today, his sacrifice is still good today. Jesus died & rose again so sin would have to stay in the grave. Realising-3 For you died, and your life is now hidden with Christ in God. Ephesians 2 we are seated with Christ. Christ releases us to live with him. Being a Pastor has come to remind me of my humanity, my habitual sins and faults did not disappear when my ICFG license showed up in the mail. Rather when I accepted my position I became incredibly aware of how desperately I needed to welcome Jesus into those areas I thought would just go away. There is no easer way to discover your shortcomings than when you are trying to lead people into a relationship with Christ. My need for Jesus to show me grace has probably increased a good 10 fold, from when I was volunteer. I have never been more encouraged by Romans 3:23 reminding me that yes everyone has sinned meaning everyone, not just most people. 2. My heart has never been so full. At no point in my life did I think I could fall in love, with the students that call East Hill Church their home. Never in my life have I cared so much for people, I grew up hearing about how much you can love someone when you look at people through the lens that Christ does. 3. Coming up with a plan to reach people is hard! When it comes to introducing people to Jesus, it cannot be because that’s what others are doing or because that is what has always been done. You have to be strategic, not just in the way that I develop sermon series or retreats. Understanding that everything that I do needs to flow through my church’s core values and student ministry vision. That I cannot just expect people to show up because we have something great going on inside, we have to pray for our schools, pray for our community, be involved with community. That the strategic planning for putting on a good service is only a minute fraction of what I should spend my time planning for. Well, that’s about all I have time to write, maybe I will blog again in another year. This summer, I had the privilege to help put on a youth conference. Here are the sessions that went down!